Baptism is the sacrament of initiation into theChurch. When you are baptized, you become a member of Christ’s one, holy, catholic, and apostolic Church – which is made up of all Christians everywhere. If you are baptized at Saint Anne’s Episcopal Church, you are also a member of this particular congregation. Baptism takes place as part of a Saint Anne’s Eucharist. While infant baptism is often the norm, it is not unusual for older children and adults to be baptized. To arrange for the baptism of your baby, toddler, school-aged child, teen, or yourself, please speak to one of our priests. Confirmation is the reaffirmation ofbaptismal vows and the adultcommitment to the Christian life, in the faith ofthe EpiscopalChurch. In confirmation, a bishop lays hands on the candidate andprays for the special gifts of the Holy Spirit. 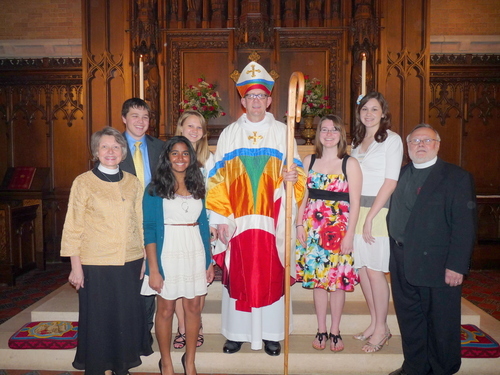 Saint Anne's has a unique confirmation program for youth. Students start a 2 year program in 8th grade, choosing a mentor. Mentors and students meet monthly for a meal, conversation, prayers. and activities. The program revolves around a passport with five milestones: faith, The Bible, community, Episcopal Church, and social justice. Students work both alone and in a group to complete activities fulfill each area. Speak to Jennifer McNally.